We have some changes coming about at Chez Starfish. I finally gave in to a tv in the main living room space of our house and it seems like by doing that, it started a cascade of redecorating interventions. Over the next few weeks we will be moving a desk and large chair/ottoman out, bringing in a new piece of furniture and large tv in, and having custom built in bookshelves built around the fireplace and mantel. So, where am I going with this? I thought I'd play around with that old redecorating tip of changing out throw pillows. What do you think? 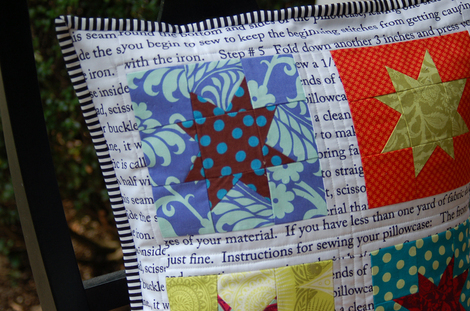 I love the text print sashing with the bright colors and I always love wonky stars. I've been working on some needlepoint lately and have a question before I can finish the piece. Kid Starfish and I drove over to my local shop but it is closed on Mondays! Why can I never remember that? It will have to wait until tomorrow, I guess! Beautiful pillow. 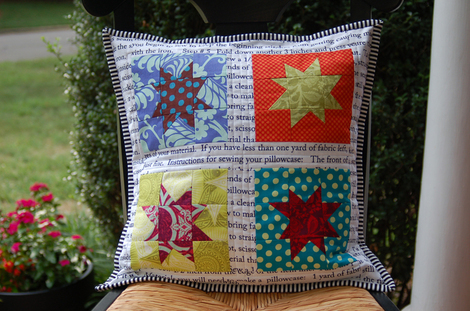 I like the print sashing and the striped binding. Very cool! Looks great! I love the combo with the text print. 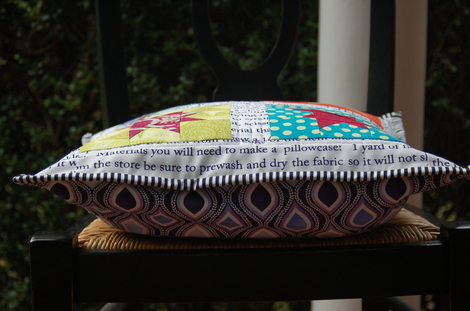 Love your pillow. It is just lovely and so colorful! Stopping in from Small Blog meet. I love the text print-- where'd you find it? I haven't been able to find any! This page contains a single entry from the blog posted on July 23, 2012 2:50 PM. The previous post in this blog was Happy Snappy Not Monday. The next post in this blog is Moxie Doxie and Small Blog Meet.